The Call and Contact Centre expo is just around the corner, and here at RingCentral, we thought we’d take the time to celebrate and introduce some of the key speakers that will be joining the lineup from our brand. For many people in the UC and collaboration industry, the Call & Contact centre event is the perfect place to go for insight into the latest technology trends that could change the call environment for both agents and customers alike. When managing a contact centre, there are countless different factors to think about, from how efficiency can be improved for the internal team, to how a system can be developed for truly proactive CX. 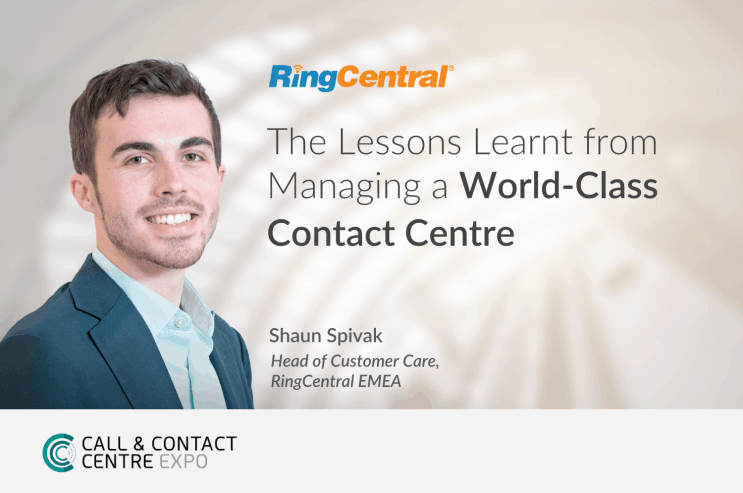 Our very own Shaun Spivak, the Head of Customer Care for EMEA here at RingCentral, will be sharing his thoughts on the lessons that can be learned from managing a world-class contact centre at the approaching conference. Shaun Spivak is responsible for managing customer care with customers across the EMEA region for RingCentral. He deals with everything related to post-sales management, from professional services to implementation and deployment, number porting, training, and support. During his time at the Call & Contact Centre Expo, Shaun will be providing an insight into some of the tools and resources he uses each day basis within his world-class contact centre environment. These are programs that he uses consistently when it comes to managing wallboards for clients, and skilling agents in real-time. During the Call and Contact Centre event, Shaun will be sharing his message on how companies can effectively manage a world-class solution for contact centre support using the right selection of agent-enabling tools. The session will dive into some of the intuitive and dynamic resources for workforce management that is provided by the RingCentral contact centre, along with a look at how to use wall boards more effectively. Shaun will also be covering information on QA auditing, and how brands can simplify the complexities of agent skilling with the help of a live support call centre demonstration to showcase things like Smart IVR with Salesforce and productivity analysis.